Tourmaline is one of the most significant mineral groups for metaphysical use, and it includes a wide variety of different forms, colours and energy spectrums. Although Tourmaline can be found on every continent, fine crystals specimens and gems are still considered rare and often command high prices. Tourmaline made its entry into the commercial worlds of gems in 1876 when George Kunz sold a Green Tourmaline gem form Maine to Tiffany and Co. In the ensuing years, Tourmaline gained great popularity as a gemstone, and more recently its subtle energy properties have made it a favourite of metaphysical collectors and practitioners. Tourmaline is a complex aluminium borosilicate, its crystal pattern is hexagonal (trigonal) with prismatic crystals and striations running parallel to the main axis. No other gemstone has such wide variations in colours. Tourmaline can be red, pink, yellow, brown, black and various shades of green, are called Watermelon Tourmaline. 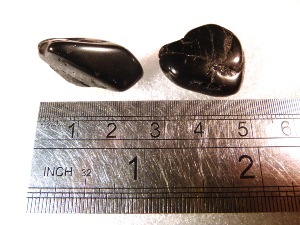 Black Tourmaline tumbled to a smooth finish, an ideal pocket size stone, small enough to carry around with you. Tumble Stones can also be placed around the home for their energies or can just be nice decorative items. 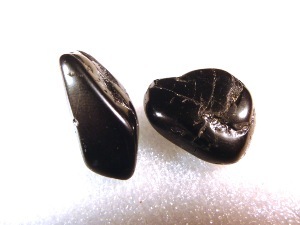 Black Tourmaline crystal gemstones of varying sizes selected specially for your order.